Are You A...Gift-Making Scrooge At Christmas? Ooopsie, I appear to have taken an unintentional blogging break for a couple of weeks. And at the risk of sounding like a right Debbie Downer, I'm back with a less-than-festive admission: I'm a gift-making Scrooge at Christmas! There, I said it...now please tell me I'm not alone! It's not that I don't enjoy the festivities or the gifting aspect of the holiday, I do! But I don't enjoy the pressure to / expectation of sewing gifts for friends and family. There are just too many people to make for, meaning I'd either have to start earlier than I'm prepared to or pick 'favourites' which I just can't do. There's also the added factor that I don't much enjoy non-garment sewing and there's no way I have enough time or skill to sew clothes for others! So it's thoughtfully shop-bought gifts all around. Anyway, enough about me! 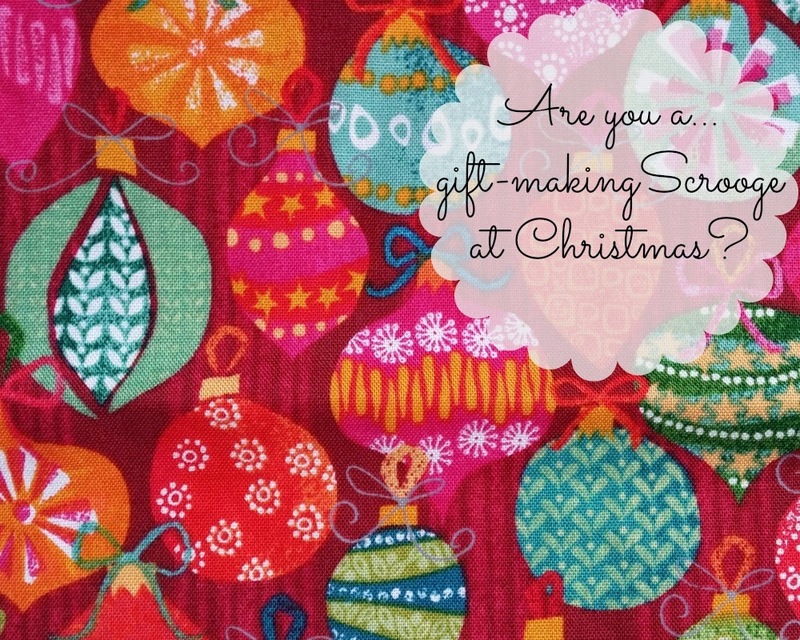 Are you a gift-making machine or a gift-making Scrooge at Christmas? I am totally with you! One year I agreed to make most of my boyfriends family crochet gifts and it was awful, I got them all done but didn't enjoy the process as I felt really pressured! Yep, the pressure takes all the fun away! Scrooge! Lol!!! I have a big family and there's just no way. I'd be sewing for Christmas all year. Like, I have 14 nieces and nephews alone! I would love to make gifts, but it feels like there is no time. I very much admire those folks that every year come up with a clever homemade gift for friends and family that is not terribly time intensive AND they manage to plan ahead far enough to get it all done. I always feel like homemade gifts are the most special. I know, how do they do it?!? When I read about all the stress some sewing bloggers have when sewing for Christmas gifts, I'm very happy gift-giving for Christmas is not a tradition here in the Netherlands. Spending time with family is, of course, and it is a good practice to bring something if you are not being the host but that is usually wine, chocolate or something else edible, depending on the taste of the recipient(s). Which means that I'm usually off the hook for the making of gifts at this time of year. This year, there is one thing though. A blouse for my grandmother which I've been working on last week (which didn't go very well). I will see her on Christmas day so it would be very nice if the blouse were finished then. What a lovely tradition, much better than gift-giving! I'm sure your grandmother's blouse turned out beautiful! I'm a hand made gift grinch all year long. The person has to be knit/sew worthy and I do have friends and family who are. They end up getting amazing gifts, for others, I'd rather spend some money and very little time. My time is precious as is my labor. You've summed up my feelings perfectly! I don't actually celebrate Christmas, but if I did, I'd be firmly in your camp! I'm admittedly very selfish with both my sewing and knitting. For me it's the feeling of a deadline - it takes all the joy out of making for me. And with so many people to potentially make for, I don't blame you one bit for being a gift-making Scrooge! Time is just so precious! I'm so with you, (I thought it was just me as everyone else seems to be churning out the gifts) and glad that it's not. I have made gifts in the past but now I don't enjoy the pressure and just keep thinking of lovely things for myself that I would prefer to be sewing…very selfish I know….oh well, on the upside my christmas dress is nearly finished!!! Thanks! A family of cat lovers then? I simply love it all! Oooh, that is handy...and your approach is much more manageable! Totally with you, my sewing time is precious. I am in an awkward situation with a friend who keeps saying infront of her daughter that I will make the girl a dress. I have no desire to and despite making this clear she has several times brought it up. She seems to think as I love sewing I'll love making her something! No No No. I know what you mean Louise. I sew for my kids and myself, that's it. I have a friend who suddenly decided I'm her personal tailor and actually went out and purchased something that not only did not fit but looked awful on her so I had to just change the style altogether. it was long and although she offered to pay, I said no. It was time I could've spent on my own projects, I can't get that back. I already have a full time job, I sew for pleasure, not profit. That's just it, time. I barely have enough for myself. If you had a friend who enjoyed cooking you wouldnt expect them to cook your dinner for you so why with sewing. One man I know asked my sew up his ripped trousers! You both make excellent points! I've had workmates ask me to make them something I'm wearing that they like, or to alter/mend their clothes, or to make them curtains etc! When I politely decline, they act all shocked and confused...surely I have nothing better to do than to sew for them!?! People who don't sew don't realise the time/effort that goes into it I think, hence they don't feel bad asking I guess! Yes, I think planning is key if you want to pull it off enjoyably! I agree, it's bad enough getting the Xmas shopping done. Who needs more stress with sewing presents. 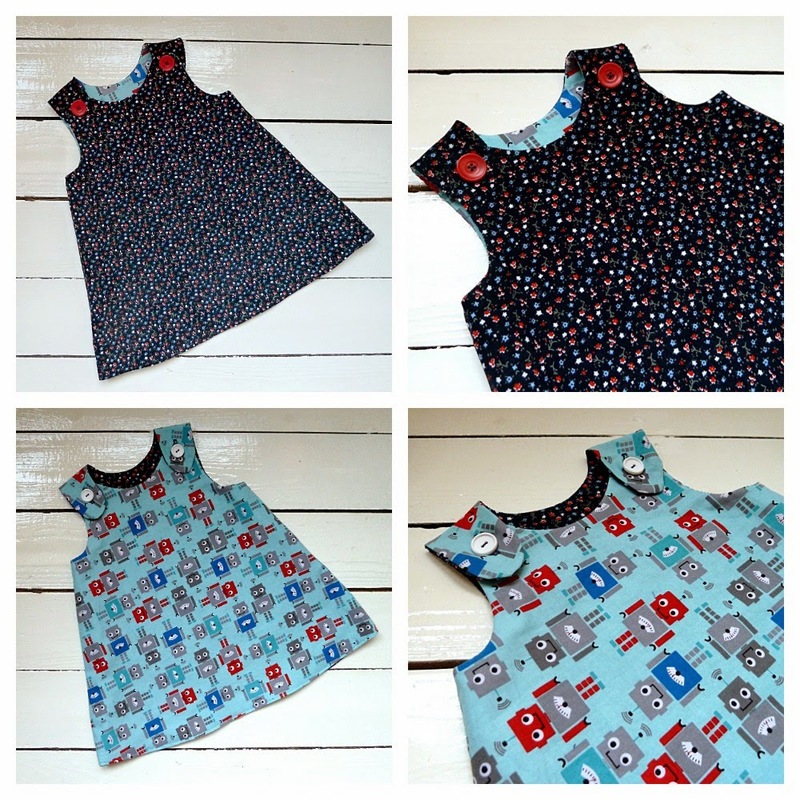 I sew gifts at other times of the year and made the itty bitty dress too. The fabrics you've chosen are adorable. Those little baby clothes are just darling. Ocassionally I make gifts but it all depends on time and inspiration. Your idea of birthday makes is a perfect compromise. Oh a Scrooge definitely, just selfish sewing most of the year! Your baby things are so cute though! What about when you do find time to sew Christmas gifts and they're not appreciated. I made my sister-in-law a lovely wool cape last year and got a lukewarm reception. I only sew for myself now! This...so much! I think originally this is what put me off doing it...sewing gifts for people and then never seeing them wear/use them! Last year, as a new sewer, I made dino tails for my nephews. Both were worn for Halloween this year which makes me feel pretty damn awesome. This year, my brothers-in-law were the only ones receiving handmade gifts. I made them dino tails too! For the most part though, I don't consider myself practiced enough to make everyone wonderful gifts. My immediate family though, is super appreciative of homemade gifts. That's fantastic and so lovely to see them get used more than once!!! I had every intention of being a gift-making machine. I bought the fabric to make two kimonos for friends, a festive scout for my mum and a dress for my nan. But time keeps running away from me and the dress is the only that's going to get made and that'll be a rush as I only got her measurements yesterday. I have made two hampers and the majority of a scarf though. Wow, you are a gift-making machine...so generous! I love to make gifts for other people. But I too hate the pressure and often don't have time. I will always make one special gift for my mum or sister as I know they appreciate it. I do make gifts for birthdays if I know what that person likes. Often it is easier to just go to the shops!! Sounds like you have a good system there! Hahaha, totally a scrooge here too. First of all, I'm too selfish. I work full time and I don't have time to sew all the things I want for me and my kids and my house. Second, other people can be surprisingly callus about handmades and I don't feel like they're giving me enough accolades (this might come back to selfishness too). Third, who has time (again, selfish!)? Thoughfully store-bought items all around here as well. I love your gifts though! You're all like, "I'm a scrooge except I did make a dozen handmade outfits for my nieces and nephews ... " HA. Not! As a real scrooge, I say you are far too unselfish! Haha, you're so funny...but I'm in total agreement! Lovely! 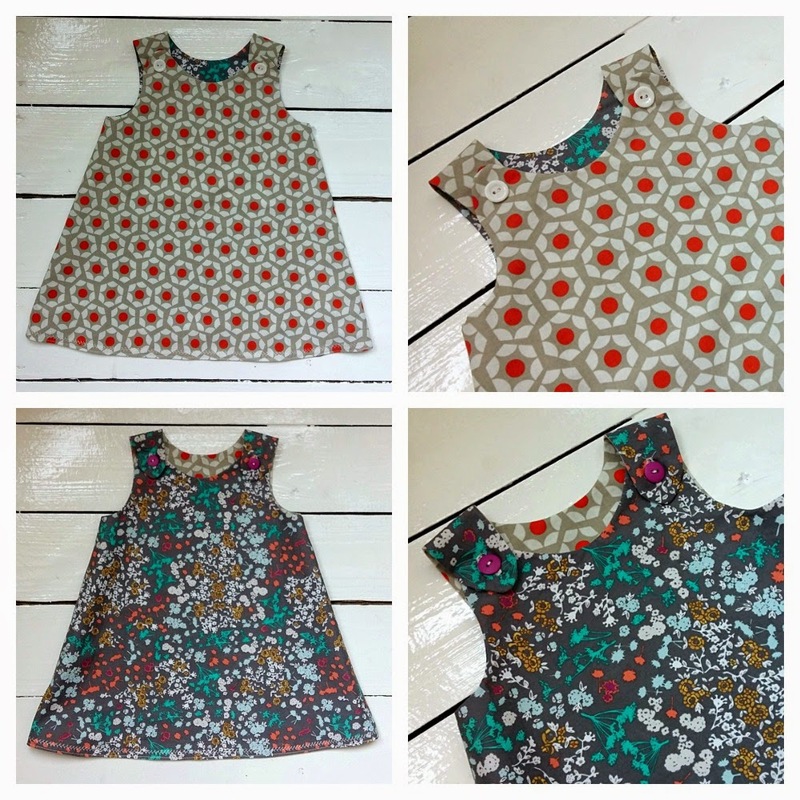 Can you tell me where you got the small floral w/ grey background on the first reversible dress? Absolutely, no need to bring stress into our hobby! I'm exactly the same at Christmas! We have way too many people to be making stuff for everyone. I have made things in the past for birthdays and when new babies are born. I'm hoping to knit my mum a cardigans for Mother's Day. Hopefully it works out. That's a great idea...buying handmade gifts is a great compromise I reckon!